Hurricane Florence made landfall Friday morning about 7:30 a.m. Eastern time near Wrightsville, North Carolina, bearing sustained 90 mph winds. 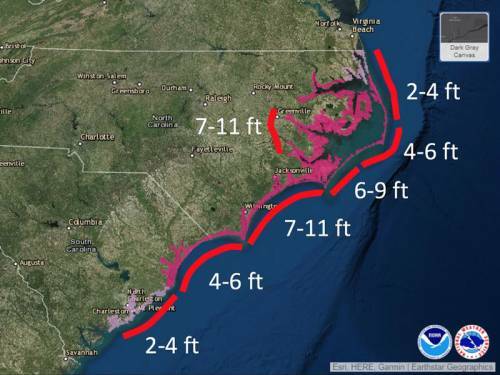 Although downgraded from recent days to a Category 1 storm, over the next 48 hours it’s expected to drop up to 30 inches of rain and create storm surges up to 11 feet in some areas in North Carolina. More than 500,000 homes and businesses are currently without power, a number that is certain to rise over the next several days as its projected to head westward toward South Carolina before turning north next week. Presbyterian Disaster Assistance has been in communication with mid councils and pastors in the area to provide resources and guidance. Kraus and her colleagues in the Presbyterian Mission Agency and throughout the Presbyterian Church (U.S.A.) are working with our partners to meet immediate needs and support long-term recovery. To support recovery efforts in the wake of Hurricane Florence, click here. You’ll be taken to the PC(USA) website to donate securely and quickly.